There is a great way to have more fun on your holidays! 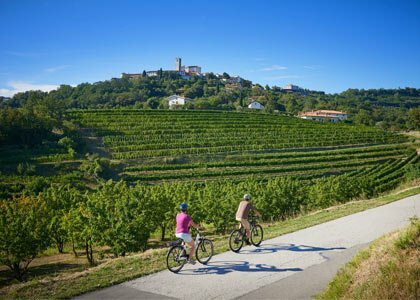 Discover Slovenia’s unique natural beauty with your bike! 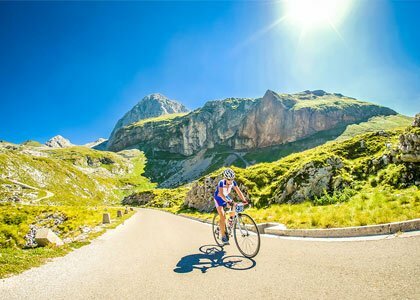 Slovenia is already renowned as a perfect destination for biking holidays. And each year offer for tourists gets even richer. Because of diverse landscape you can find amazing options for all kinds of tastes, experience level and ages. 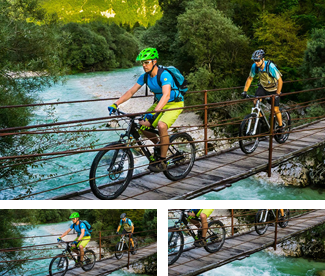 Dynamic landscapes offers wide range of opportunities for all kinds of exciting biking holidays: (Mountain biking, Road biking, Trekking & Family biking, City biking,…) – Start planning your trip and discover Mountain Biking Slovenia! 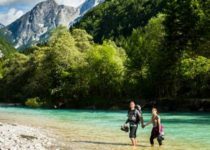 Slovenia is an Alpine country filled with mountains that just wait to be ridden with you mountain bike. Unspoiled nature and forests are packed with trails which you can easily discover –> sounds interesting? How would you like to paddle down easy single trails in wonderful nature, or ride the longest flow trail in Europe? Do you maybe prefer a more challenging technical trails descending from majestic Julian Alps? 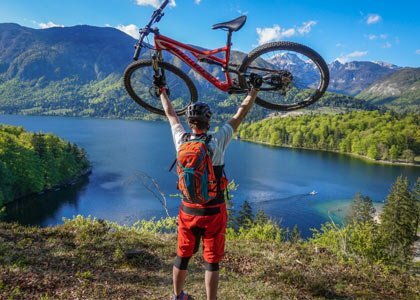 Mountain biking Slovenia will amaze you with so many options and perfect scenery. Diverse landscape enables you to combine technical mountain trails in the Alps with nice panoramic flow trails in the sea side, within an hour drive! Adrenaline junkies will love bike parks that open already in April and run until late autumn. Cross country lovers will be amazed by vast network of diverse tracks craved in World war one. Enduro mountain bikers will love Krast and Soca region. All other recreational mountain bikers can find amazing trails everywhere! 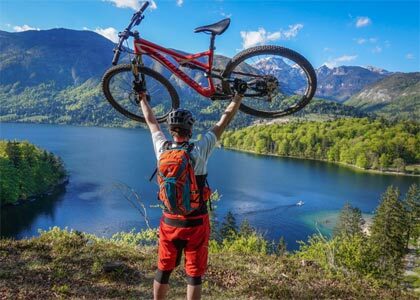 Slovenia offers unlimited mountain biking possibilities, where every mountain biker can truly enjoy mountain biking Slovenia! Looking for more information? Get your free adventure holiday plan! Depending on your level and plan you can choose from a wide range of options. From demanding uphill challenges in the Alps, to quiet county roads with spectacular views in the coast. Julian Alps and Triglav national park offer many famous mountain roads and alpine passes. Ranging from easy to very difficult. If you prefer easier tours – don’t worry. You can use diverse Slovenian landscape in your favor. Discover amazing hidden county roads with low or no traffic. There are many renowned Road Cycling loops all over Slovenia. From longer loops in the country side filled with amazing views. To shorter ones, where you can stop and enjoy local culinary specialties or wine. Check out most renowned areas below. If you need more details and information get you free Active holidays plan now. Slovenia is also a great place for recreational mountain or road biking. 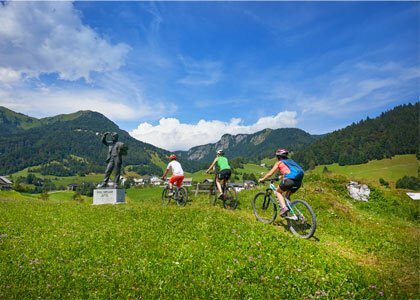 If you are looking to combine active holidays on your bike, with amazing nature and local culinary specialties – than this is your style of biking! Slovenia offers many really nice tracks reserved just for biking. 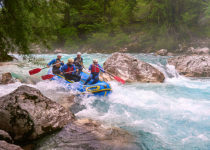 You can discover the wonders of: Triglav national park, Soca valley, Krast region, Costal region and much more. Along the road you can stop and discover amazing scenery and local tourist attractions. Along the road you will also find allot of restaurants and local farms, where you can enjoy local culinary specialties and taste wine. Experience you will not forget! Check out most popular places for trekking biking below. If you are looking for more details get you free Active holidays plan now. 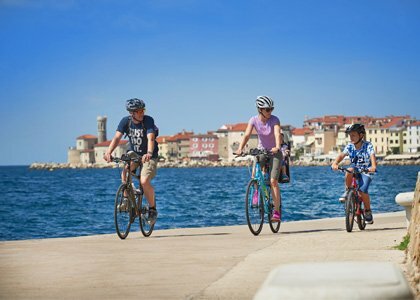 Looking for an active biking holiday that will inspire the kids? 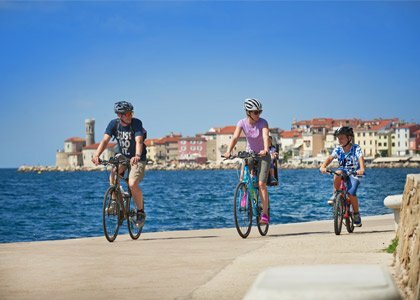 Slovenia can offer perfect family bike trips that are suitable for children of all ages. 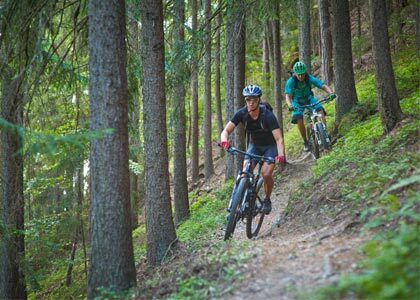 Find yourself exploring Slovenia nature riding your bike on reserved cycling paths, quiet roads with no or little traffic or a simple forest trail. Take your family on an unforgettable experience! Combining easy biking on safe quiet roads with amazing scenery. 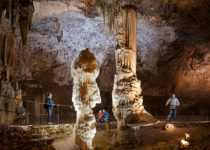 You can easily access local natural or tourist attractions and stop in restaurants along the road. Get your Leisure holiday plan, to get more detailed information about tracks, restaurants, attractions and much more! The best way to discover a city is with your bike! Spend your day avoiding big crowds and experience hidden corners of the city with your bike. You will see much more and save energy for things that matter! The true adventure begins with a bike!